Vasilevskiy’s about to save this, somehow. In a just world, the Lightning and Maple Leafs would meet in the Eastern Conference final. But it is not a just world, and because the two clear best teams in the East also happen to be the two best teams in the Atlantic Division, the NHL’s playoff format puts the two on track for a second-round showdown. It’ll be fun, but ... too early. 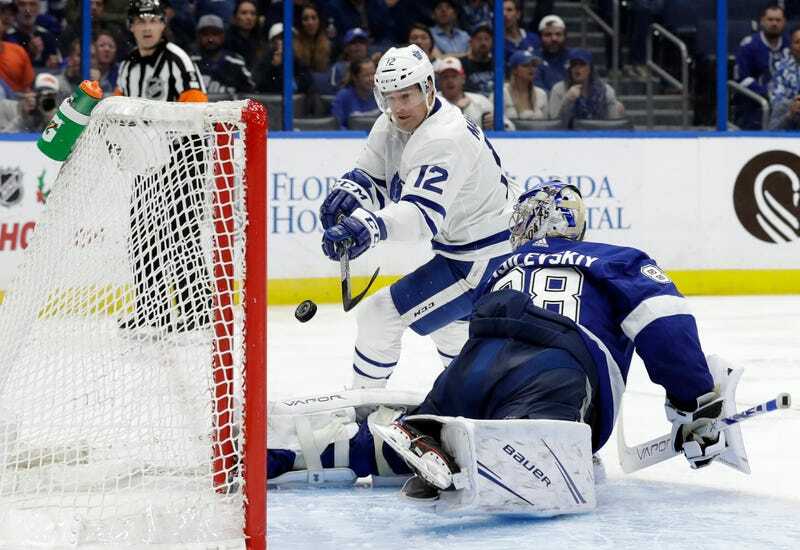 The Leafs outshot the Lightning 49-21, and it was only Andrei Vasilevskiy, who returned after a month out with a fractured left foot, that made this one look like a statement game. Vasilevskiy did make a statement, though. With a career-high 48 saves he reminded everyone, no matter how well Frederick Andersen has been playing (or Louis Domingue, for that matter), that Vasilevskiy is the best goaltender in either locker room. That’ll matter in the spring, and it matters now. Vasilevsky made a big stops in short succession against Auston Matthews and John Tavares in the first period to keep the game close, but it was this one (or two or three? ), on Patrick Marleau in the third, which is a save of the year candidate and was about as improbable as saves get. You absolutely will not grasp it until you see the replay. I’m in awe of the presence of mind, the spatial awareness, and the sheer body control to be able to dig out a bouncing puck behind him with just his toe. “[Vasilevskiy] was the best player on the ice for us by a country mile,” Lightning coach Jon Cooper said. Oh, you want more saves? Andrei’s got saves. Both teams can take away positives from this game. Toronto should be buoyed by the knowledge that it can come onto Tampa’s home ice and thoroughly outplay the Cup favorites. And the Lightning should feel good about the fact that that can happen, and they can win anyway. “I don’t think you want to hang your head,” Tavares said. “You’re disappointed in the result...It’s a long season. We will see these guys again.” In the playoffs, anyway, sooner than we’d all like.